After testing out a few things, I finally came up with my first prototype trading system. Now, I have to warn y’all that I’ll be using quasi-programming language to present the rules of the system. However, don’t fret if you feel overwhelmed, since I’ll also do my best to explain the rules in simple English (with pictures to boot). And as always, you can just shoot me a comment below if you have any questions (or if you noticed an error somewhere). With that said, here are the topics I’ll be covering today, so feel free to jump to the topic you want to see first, although it would make much more sense if you read everything. And if you haven’t already, you may also want to read my 2018 Trading Resolution to understand my goals for this system, as well as the underlying trading principles that form the foundation of this system. Almost everything should be pretty self explanatory. But why use the 120-period average true range (ATR), I hear none of you ask? Well, my rationale for this is that is I want to build a trading system that automatically adapts to and can (hopefully) survive changing market conditions. And one of the simplest way to do that is to base my stop loss and targets on the ATR. However, I also want to have a large enough sample size for the ATR. Too small and the ATR will be too sensitive to recent price action. Too big a sample size and the ATR may end up being too inflexible for setting targets and stops. 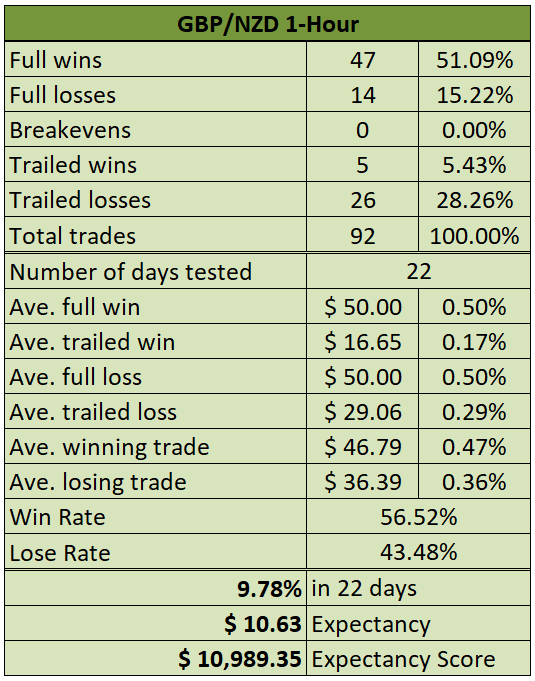 Anyhow, a week’s worth of data is good enough, which is why I used a 120-period ATR (24 hours in 1 day, 5 days in 1 trading week). 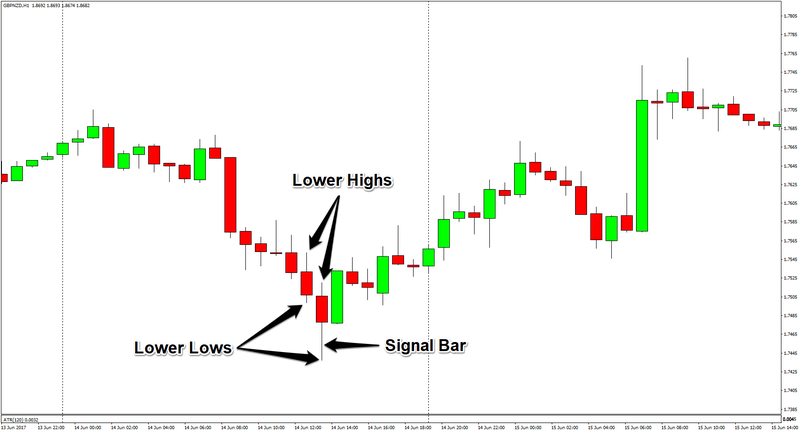 Translation: If two consecutive candlesticks form lower highs and lower lows, and if the the low of the signal bar (i.e. recently formed candlestick) is lower than the lows of the three previous candlesticks, then set a buy stop order at the high of the candlestick prior to the signal bar. And while you’re at it, set your stop loss by subtracting the value of ATRH from your entry level. After that, you set your target profit level by adding the value of ATRH to your entry price. In the example above, the signal bar was completed on June 14, 2017, 3:00 pm GMT. The high of the candlestick prior to the signal bar was at 1.7552, so we set that as our entry. The ATRH at the time was 42 pips or 0.0042. Our SL is therefore at 1.7510 (1.7552 – 0.0042) while our TP is at 1.7594 (1.7552 + 0.0042). And as marked above, our long order got filled four hours later at 7:00 pm GMT. And our target was hit four hours after that at 11:00 pm GMT. Simple, right? Translation: This just means that if our existing long order isn’t filled and the next candlestick after the signal bar has lower highs and lower lows, then that means that the pair likely hasn’t found a bottom yet. We therefore basically use the newly formed candlestick (BarA) as the new signal bar and make the necessary adjustments to the existing stop entry order. Translation: We only move our stops on our longs whenever there are higher highs, higher lows. And we use the low of prior bar as our new stop loss. Translation: It’s basically just the opposite of the rules for going long. So if two consecutive candlesticks form higher highs, higher lows, and if the high of the signal bar (i.e. 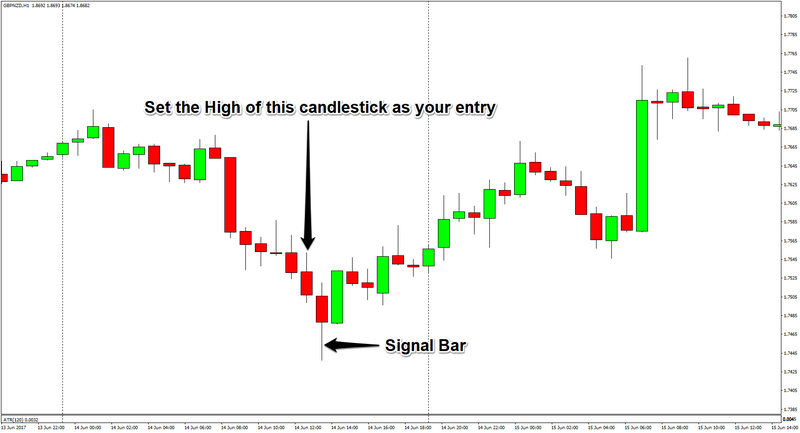 recently formed candlestick) is higher than the highs of the three previous candlesticks, then set a sell stop order at the low of the candlestick prior to the signal bar. And while you’re at it, set your stop loss by adding the value of ATRH from your entry level. After that, you set your target profit level by subtracting the value of ATRH to your entry price. See? Told ya it was just the opposite of the rules for going long. Translation: We just do the opposite of what we do for our long positions. Translation: Yep, you guessed it. We just do the opposite of what we do for our long positions. Translation: If 6 hours have passed since the signal bar was completed and we placed our order, then cancel that order. Pretty sweet, right? 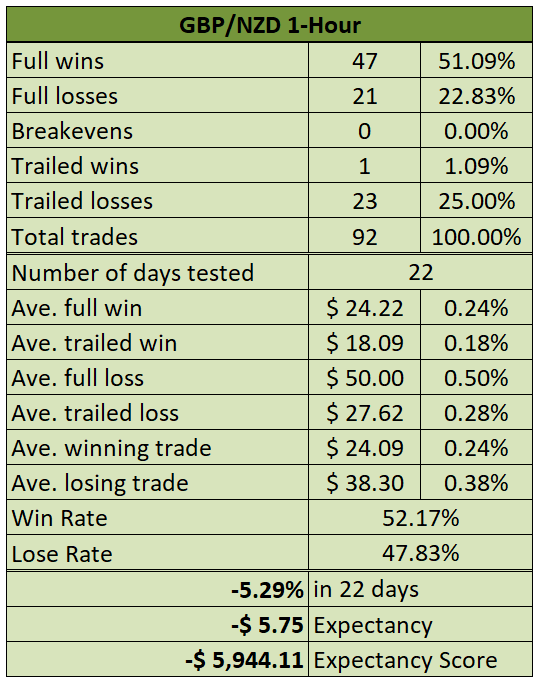 A win rate of 56.52% and 9.78% in just 22 days of trading. Moreover, we have positive expectancy and if we project that, we can expect to gain $10,989.35 in one year. In other words, we can expect to double our account in one year. Also, do note that our reward to risk ratio here is only 1:1 since we risk $50 or 0.50% of our account in order to also get 0.50%. 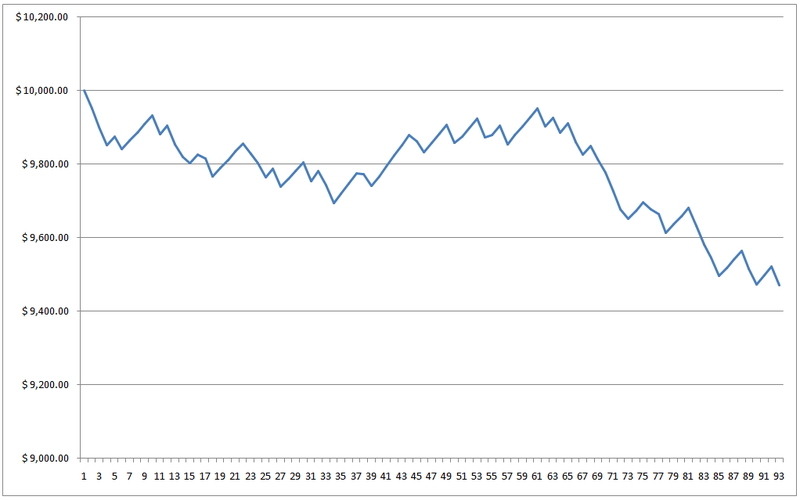 Take note that I changed my spread from none to a fixed spread of 12 pips. Why 12 pips? Well, that’s because most brokers that offer fixed spread have them at 12 pips for GBP/NZD. I can use a floating spread for my assumptions. 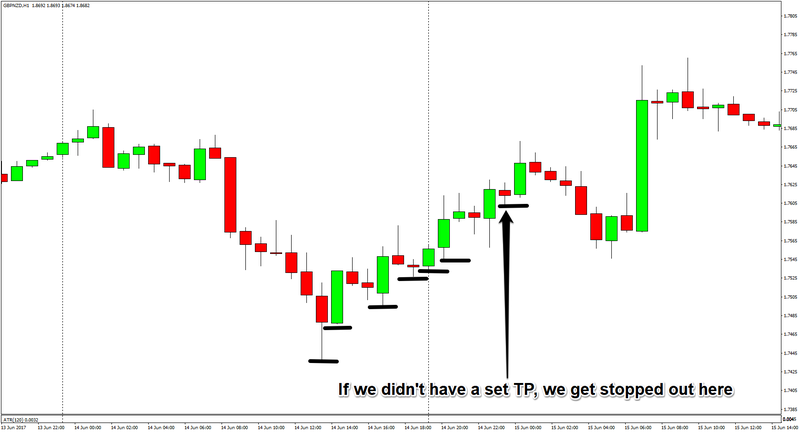 And under normal market conditions the spread on GBP/NZD is usually between 5-6 pips. However, that tends to widen greatly when their are top-tier events, such as the RBNZ statement or the BOE statement. Anyhow, I chose the fixed spread so that we have better control over our costs (and because historical floating spread data are harder to come by). Ouch! That ain’t good. 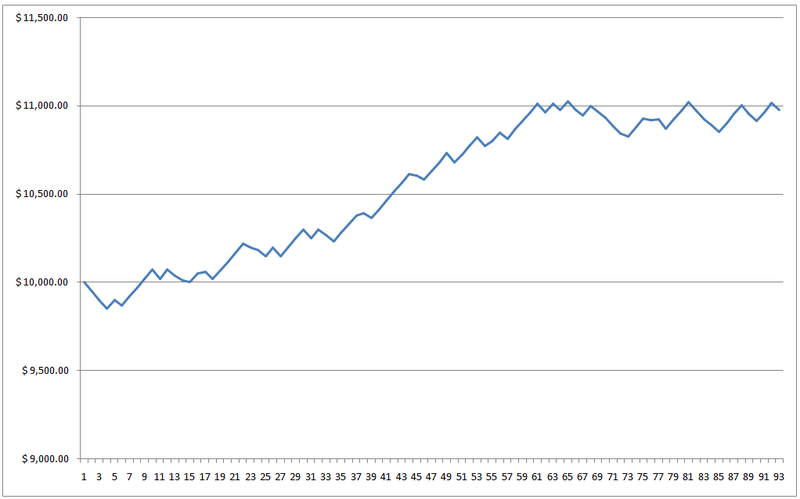 We do have a win rate higher than 50% but since we take spread into account, our reward to risk ratio is no longer 1:1. Instead, our reward to risk ratio is now only 0.48:1. And since our win rate is just not high enough to compensate for our low reward to risk ratio, our expectancy ends up being negative. This prototype trading system shows great promise on paper. However, if we apply real world conditions by using a fixed 12-pip spread, we can quickly see that the system ain’t really that good. 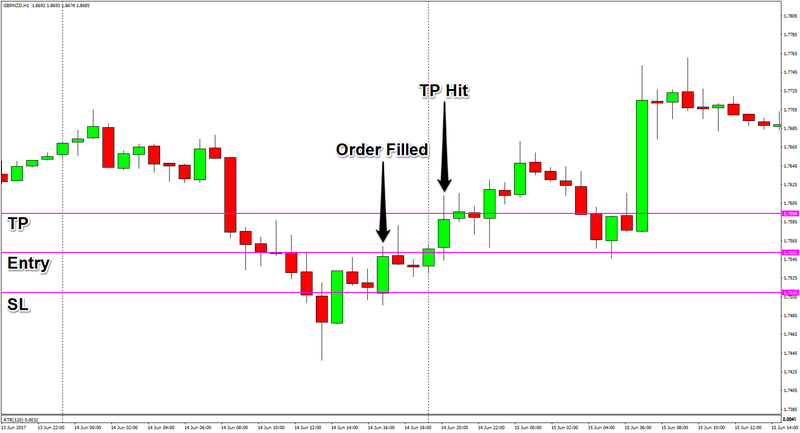 And the reason for this is our gains are limited and the spread relative to our gains is just too big since ATRH, which forms the basis for our TP levels, is usually around 34 pips. However, one great lesson from this prototype is that using higher highs, higher lows and lower highs, lower lows as an entry does give us an edge since out hit rate is above 50%. In other words, we get better odds than simply using a coin toss to determine entries, so we definitely have an edge. My goal for the next version, therefore, is to find a way to let our profits run. Alternatively, I can try to find the optimum fixed profit target since the high spread on GBP/NZD renders the current prototype ineffective. At the moment, I’m planning to just remove the TP level and just let the trailing stop method do its magic, but that’s just my initial idea, so I may choose a completely different route. Also, do note that we haven’t included the inside bar as part of our entry method yet, so I’ll also try to find a way to do that by next week. That’s a low priority at the moment, though. Okay, I hope I didn’t cause any of you to suffer from brain freeze or convulsions. And as always, I enjoy getting your feedback. So if you have any suggestions, questions, or if just want to say “hi” then don’t be shy and write a comment down below!